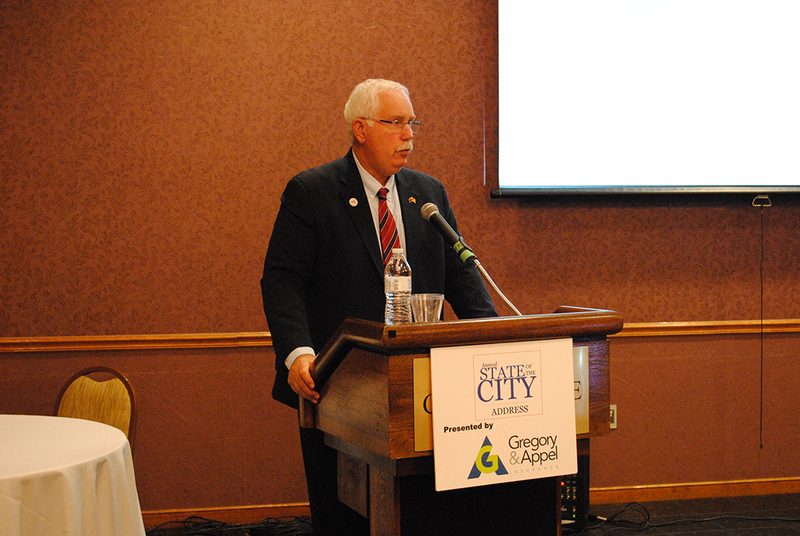 Lawrence Mayor Steve Collier shared his vision for the future and delivered a financially positive message during his March 7 State of the City address. “I’ve lived in this city for 60 of my 64 years. We have a rich history, but we cannot continue to claim to the old and tired ways of doing business of the city,” Collier said. “We must become a city with a vision, a city with big ideas and a city with leaders who can pave the way to make (those big ideas) a reality. Collier opened his address by summarizing 2018. Collier said the savings increased 270 percent in the last three years, which led to five Standard & Poor’s rating increases for Lawrence within three years. That, in turn, raised the city’s grade to an A-plus, which has saved the city more than $1 million in borrowing costs. “This is a critical benchmark in financial responsibility,” Collier said. Collier said that six years ago the city only had approximately $70,000 in operating reserves, leading to frozen wages and crumbling infrastructure. Collier noted several new trades and industrial businesses, such as Meyer Plastics, which combined will bring more than 500 high-paying jobs to the city. Collier said he expects the Meyer Plastics ribbon cutting to happen in about a month. Lawrence police officers and firefighters also saw enhancements in their operations, such as updated squad cars, ambulances and new body cameras. “For the third straight year, we increased our spending to $14 million in additional funding allocated to police and fire since 2016,” Collier said. The Lawrence Police Dept. hired nine new police officers, pushing the department’s staff to 62. “We are fully staffed in police officers for right now. It is becoming increasingly hard to attract new people in this position,” Collier said. LPD added 14 new vehicles to its fleet in 2018 and plans to add 15 to 20 this year to completely update the fleet. Construction on the new police headquarters on Post Road is nearly half complete. The station should be open by October. Mayor Steve Collier noted that Fort Benjamin Harrison was named one of five finalists for TechPoint’s Mira Rising Tech City Award. TechPoint is a nonprofit, industry-led growth initiative for Indiana’s tech ecosystem. Collier said the city will learn next month if it wins the award. The city and the Greater Lawrence Chamber of Commerce, McKenzie Career Center and Lawrence Township Schools, partnered to conduct a trades, technology and innovation symposium in April 2018. This year, Collier said the groups will collaborate again to conduct the second symposium in the series, which will focus on workforce development and education in the health care and life sciences industries. The luncheon will be April 18 at Roche Diagnostics, 9115 Hague Rd. The panel will feature Community Health Network Chief Experience Officer Ron Thieme, Metropolitan School District of Lawrence Township Supt. Shawn Smith, Roche Diagnostics Vice President and Site Head of Human Resources Bridget Boyle and Vice President and co-founder of Ascend Indiana Bridget Stephanie Bothun. Registration is required by April 12. For more, visit greaterlawrencechamber.org/events/details/business-matters-luncheon-healthcare-life-sciences-1631.